This tour in the mid-coastal region of California is made up of stages recycled from two of our previous tours, the Condor Country Tour and the Central Coast Tour. 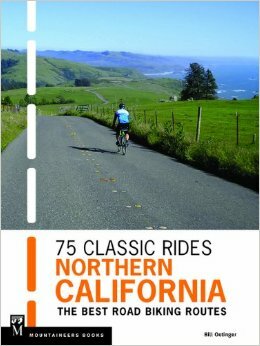 Four of the stages are in or near the Santa Ynez Valley (Solvang-Santa Barbara area) and three work out of a base camp in Paso Robles. As planned, you would drive—not ride—from the Solvang area to Paso Robles to connect the two hubs, but that drive day will also include a full stage to be ridden after the short drive. While three of the stages are almost the same as on the previous tours, the other four incorporate some old roads into new routes that will allow them to function as loops from central hubs. Climbs from a lovely camp on the wild Santa Ynez River to the mountain village of Painted Cave, then plunges down Old San Marcos Road—not San Marcos Pass—to the outskirts of Santa Barbara before climbing back to the ridge on (in)famous Gibraltor Road. 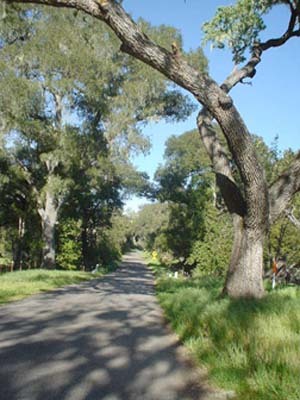 Runs the length of the ridge on Camino Cielo—as spectacular a back road as there is anywhere—and finally tumbles off the ridge and back to camp along old Stagecoach Road, past historic Cold Springs Tavern. No showers at camp, but the river has many lovely swimming holes, both near camp or along a short ride deeper into the canyon. The only point-to-point stage, this gem moves from the high camp at Sage Hill down past Lake Cachuma and into Happy Canyon, one of the prettiest, most bike-friendly valleys imaginable. The longer route climbs up and over Mt. Figueroa on a very hilly, very scenic route…nearly as spectacular as Camino Cielo. All routes visit charming Los Olivos and the quaint Danish village of Solvang. An optional run to beautiful Nojoqui Falls completes the smorgasbord of cycling variety on the day. Finish up at Flying Flags Travel Park in Buellton, a full-service RV and camping resort, complete with showers, pool, and hot tubs. We will camp here for three nights. This simple route proved very popular on the Condor Country Tour. A nearly level cruise through the bottom lands of the Santa Ynez River—walnut orchards and meadows—then over a small summit (or two) and down to remote Jalama Beach…and back. Can be turned from an out-&-back into a loop with certain route modifications. Both routes include the optional possibility of a visit to one of the best preserved and most extensive of the California missions: La Purisima Concepcion. This is the essential Santa Ynez Valley cycling experience. It’s a loop around four great back roads: Drum Canyon, Cat Canyon, Foxen Canyon, and Ballard Canyon. Each road has its own personality, and collectively they add up to an excellent ride, sometimes in the woods, sometimes out across open meadows, and often amidst thevineyards of the valley. The short option is offered because it’s there, but most won’t feel the need nor the desire to shorten this relatively easy, very scenic loop. Drive from Buellton to Templeton—approximately 80 miles—and park the car pool fleet at a local school. Then set out on an exploration of the coastal hills west of Paso Robles. York Mountain, Santa Rosa Creek, Old Creek, and Peachy Canyon are the featured attractions, plus a visit to the seaside villages of Cambria and Cayucos. Short-course riders will retrieve the cars and drive on to camp in Paso Robles, while the long-course riders will get there on pedal power. Shortest option avoids the stout climb on Old Creek. Spend two nights in a motel in Paso Robles. The longer route takes a hilly meander along magical Adelaida and Chimney Rock Roads before joining the shorter course on Lake Naciemento Drive for the climb past the lake, over the summit, and down into the next valley at Jolon Road. Through the little town of Bradley and then up remote, peaceful Hare Canyon and down Indian Valley and along River Road back to Paso. Scenery is similar to the rest of the tour: the central coast’s classic early California landscape of oak-dotted meadows, wooded hills, and premium vineyards. This little ride is something you might do on your getaway day. The start/finish town is a few miles SE of Paso Robles. You could drive there, do the short, relatively easy ride, then high-tail it to wherever you’re heading. Is it worth doing? You bet! These roads and the surrounding countryside are as nice as anything on this tour…pretty nearly purest bike heaven.